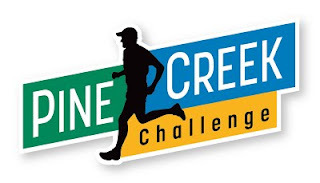 The "Pine Creek Challenge" is just that, a place to challenge yourself by seeing how far or how fast you can run. It will be a scenic trail run along Pine Creek in northern Pennsylvania. The Pine Creek Rail Trail stretches 63 miles from Wellsboro Junction to Jersey Shore and is repeatedly listed as one of the finest bike rides in the Northeast.This section is through the "Grand Canyon of the East", the Pine Creek Gorge. The Gorge stretches for 47 miles. It is nearly a mile wide and 1,450 feet deep at its deepest point. This section of Pine Creek is listed as a National Natural Landmark. It's popular with canoeists and rafters in the spring and trout fishermen are drawn here all year long. We have set up an out and back course that uses 25 miles of the upper canyon section. Everyone loved this new 2016 course layout. We will have the start/finish at Asaph. The 100 miler runners will go 2 out and backs to Blackwell, passing through the canyon 4 times. The 100k folks will go once to Blackwell and return.